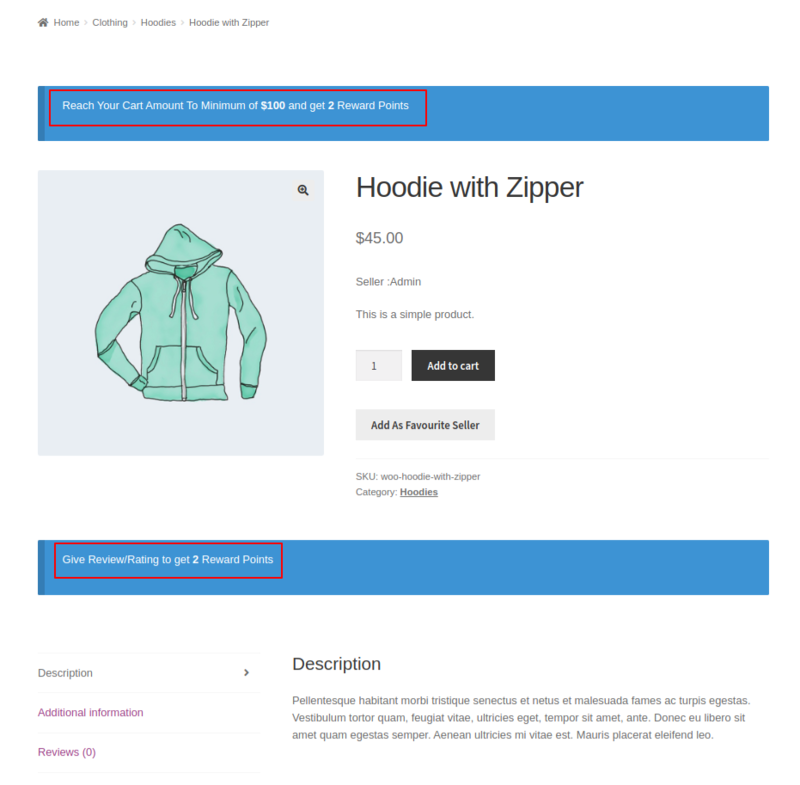 WordPress WooCommerce Marketplace Reward System allows the sellers to add reward points to their products using which customers can purchase the seller’s product. Here sellers can add reward points to each product. Customers receive the reward points after the product purchase. WordPress WooCommerce Marketplace Reward System is an add-on of WordPress WooCommerce Multi-Vendor Marketplace Plugin. 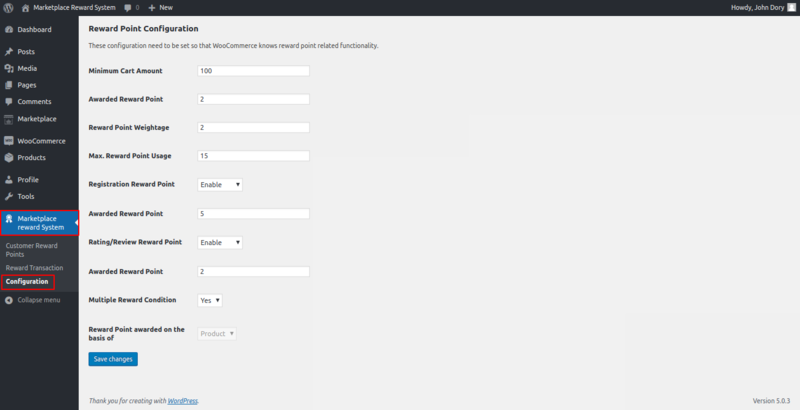 To use this plugin you must install WordPress WooCommerce Multi-Vendor Marketplace Plugin. Reward points are split on the basis of the ratio in which the amount is split amongst the admin and seller. After clicking on the “Upload Plugin” option, below that you will see a button “Choose File” click on the button to browse for the zip file as per the snapshot below. After successful installation of Marketplace Reward System, the admin can configure the plugin by navigating through the Marketplace Reward System > Configuration. Minimum Cart Amount: The admin can define the minimum value of the cart total to allocate the reward points to the buyer. Awarded Reward Point: The admin enters the reward points that are to be allocated after successful checkout with minimum cart total. Reward Point Weightage: Value of each reward point. Max. Reward Point Usage: Maximum reward point can be used per checkout. Registration Reward Point: The admin can enable/disable the reward points per new buyer registration. Awarded Reward Point: Number of reward points awarded after successful registration. Rating/Review Reward Point: The admin can enable/disable the reward points per new rating/review. Awarded Reward Point: Number of reward points awarded when the buyer gives a new rating/review. Multiple Reward Condition: The admin can choose whether he wants to award reward points on both the conditions matched, cart and product. Or only for any single condition. Reward Point awarded on the basis of: Here the admin can select the basis to award reward points to the customer. The admin can manage a buyer’s reward points manually by simply navigating through Marketplace Reward System > Customer Reward Points > Manual Reward Transaction. Here the admin chooses the customer from the drop-down list for which he wants to debit/credit reward points. Thereafter, the admin can navigate to Marketplace > Seller List, where the admin can view the list of sellers. Thereafter, the admin can navigate to Marketplace > Seller List > Manage > Orders so as to view the details of a particular order id. The admin can choose a particular “Order Id” under the Order and under Total Commission, view the commission received and the reward point allocated. The Total Seller Amount includes the seller amount and the reward allocated to the seller. Under the Transactions tab, the admin can select a particular “Transaction id” associated with a particular Order Id. In the image below the admin chooses the Order Id-73 and Transaction id associated with it. 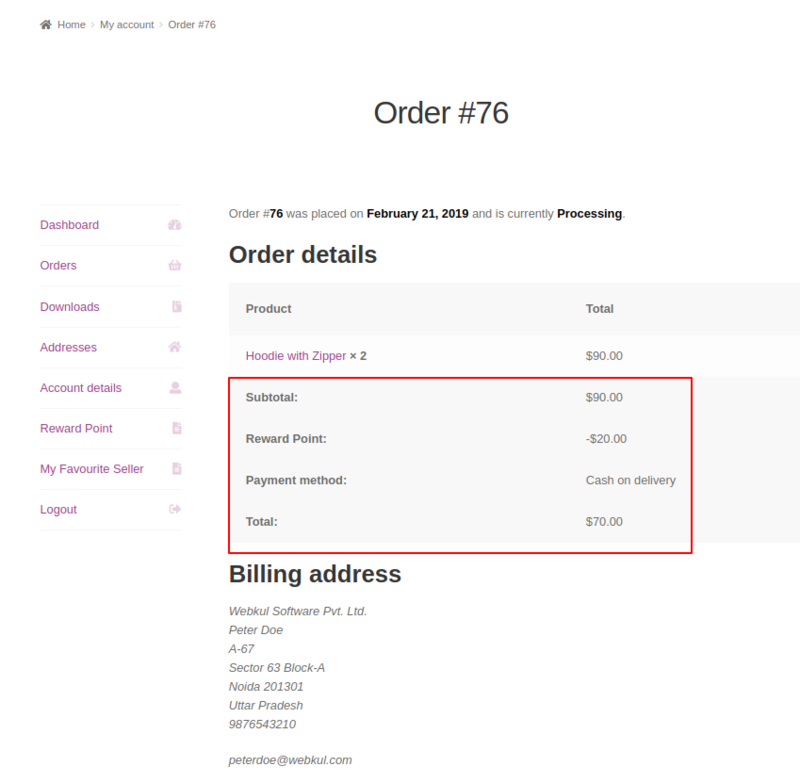 On clicking the view button for the Transaction id for Order Id-73, the Information of the respective Transaction Id opens up. The admin can view the reward point distribution amongst the admin and seller, under Commission and Subtotal columns, respectively, as shown in the image below. The reward points shall be distributed as per the ratio of the amount which is distributed amongst the admin and seller. For instance, if Rs 200 is distributed as Rs100-Rs100 to the admin and seller respectively, and the reward point is 20, then both the admin and seller shall receive 10 reward points, each. Under Products > Add Product, the seller can create a new product. The seller can also choose a product from the Product List and edit that product so as to enable the reward points. 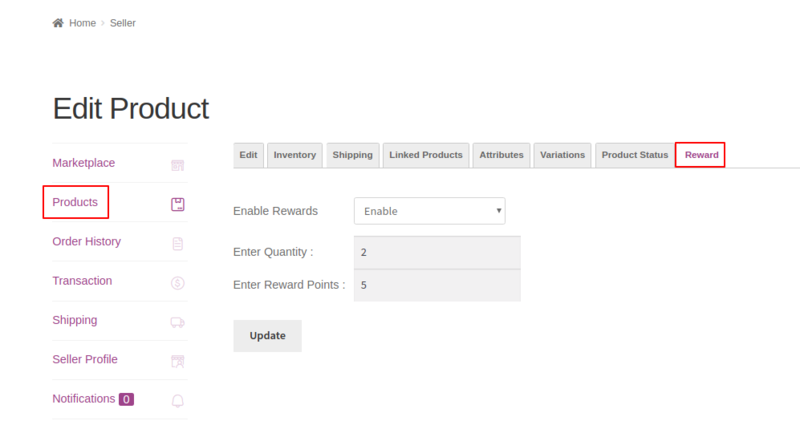 On the Edit Product page under the Reward tab, the seller can enable reward points for a particular product. The seller can also define the minimum quantity and reward points for that particular product as shown in the image below. 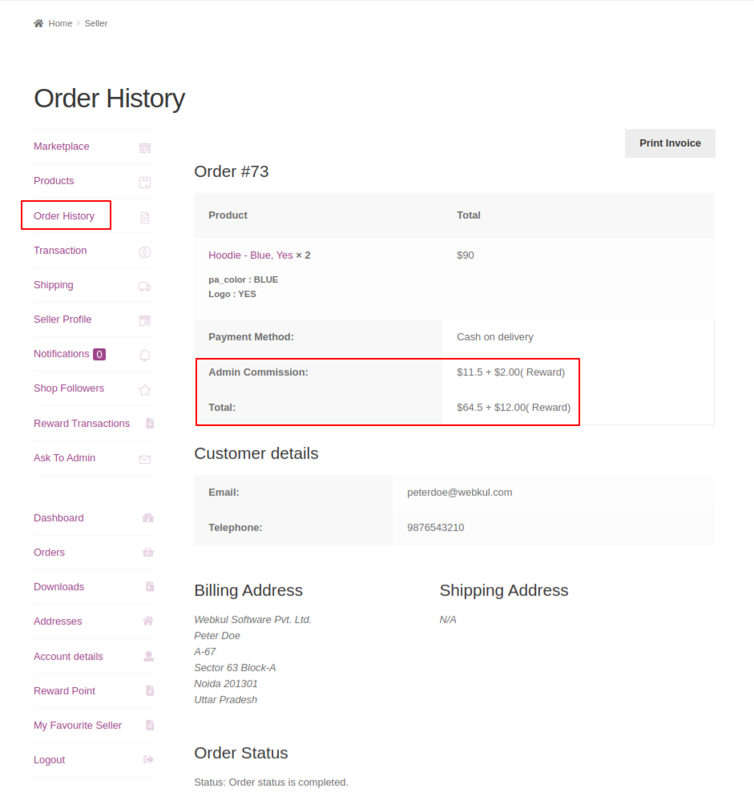 Under the Order History tab, the seller can view the details of an order id by simply clicking on the View button as shown in the image below. The details of the order id chosen by the seller displays as shown in the image below. The distribution of the reward points for the Admin and the Seller is shown against the Admin Commission and the Total, respectively as shown. Note: The reward points are split on the basis of the ratio in which the amount is split amongst the two. 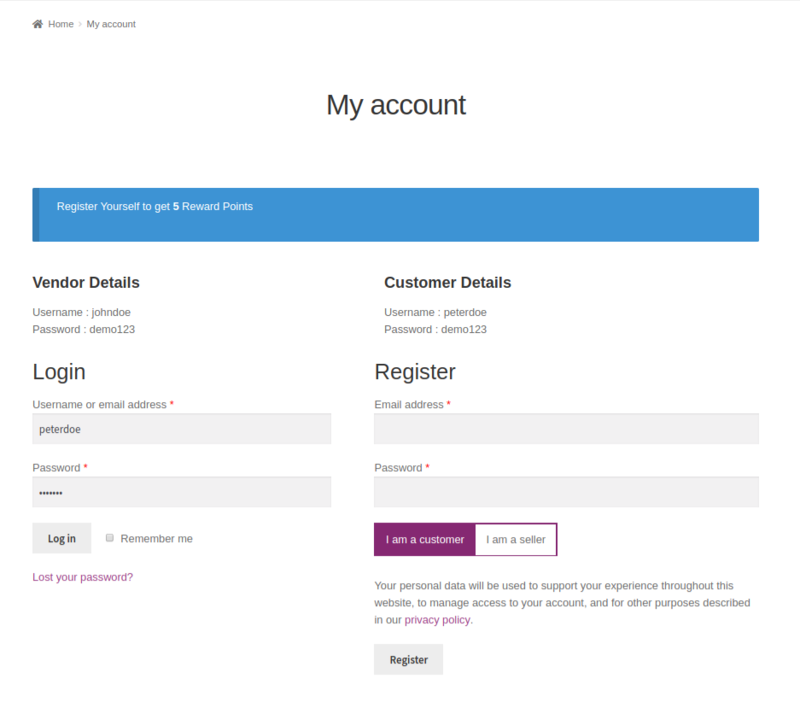 In the front end, the buyers shall receive the notifications on the registration page, if enabled. On the product page, also the buyer receives the notification about the reward points for product and review if enabled. 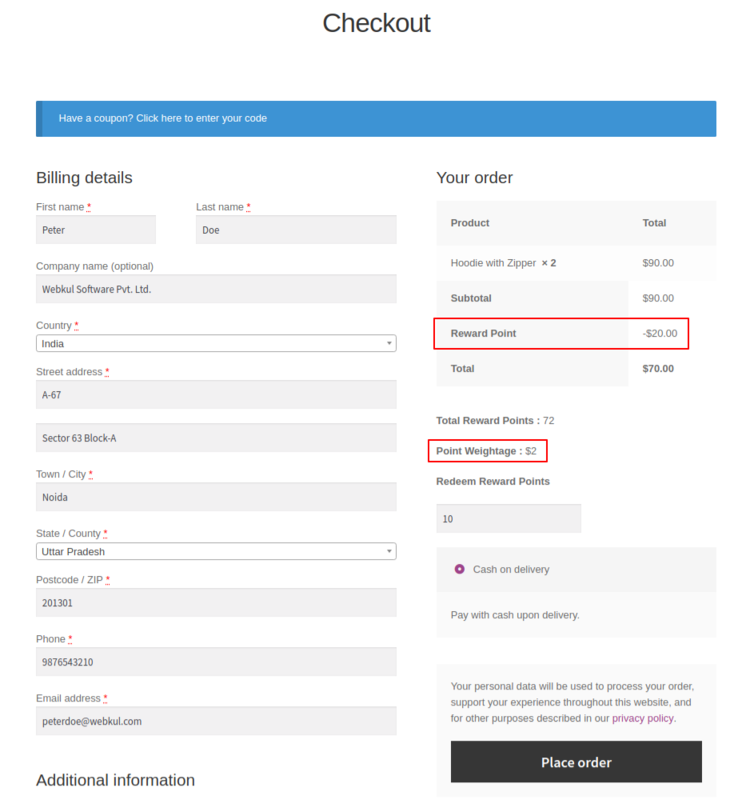 The buyer can use the available reward points for the product at the checkout page. Under My account > Reward Point, the buyer can find all the details of reward points. 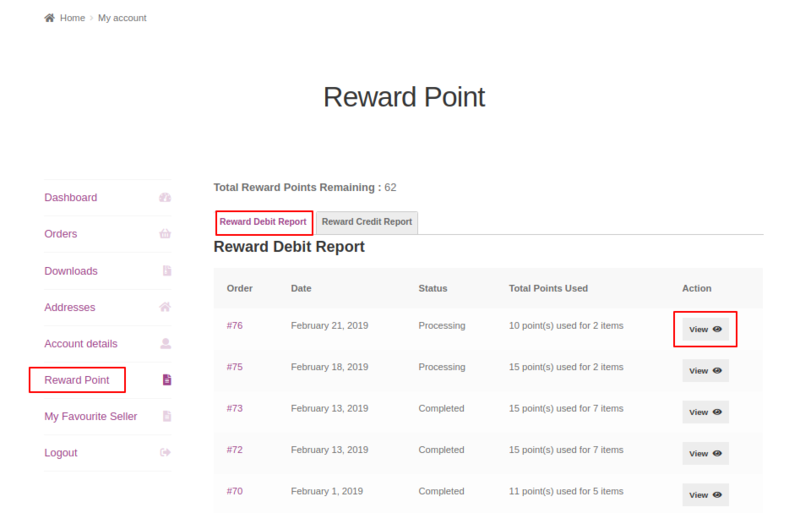 The buyer can click on the Reward Debit Report so as to view the details of the reward points used for a particular product. On clicking the View button for a particular order id, the buyer can view the order details and the details of the reward points used for that order id as shown in the image below. Great article. The Information you shared is quite appreciable. It helped me a lot. Will love to follow you from now. Thanks for the appreciation. We will try to add more articles to the products so that the customers will get the latest updates from our end. Thanks, mate, for the reply and work you are doing, is quite great and content in your articles is commendable. Keep it up.